Instant Access to Premier Road Racing Circuits. Drive All Day, SMILE ALL DAY. We are planning ten track events for this season. This year we will be visiting AUTOBAHN COUNTRY CLUB in Joliet, Illinois eight times and ROAD AMERICA in Elkhart Lake, Wisconsin twice! Wednesday Afternoon ADVANCED DRIVER DAYS! The most track time for your dollar, that is easy on your work, and family schedule. You’ll get 3 hours of track time, and the events will be held on three Wednesday afternoons throughout the season. If you’d like to pay via credit card please click on the Event. On the MotorSportReg page, continue to the bottom and press the continue button to register and make final payment. Otherwise you can just shoot us a check made out to Laps Incorporated for the appropriate amount. Mail it along with your name, track pack and events chosen, mailing address, and email. 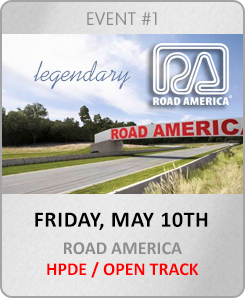 • Guest passes are not valid for Road America. TRACK PACK 6 • New for 2018! 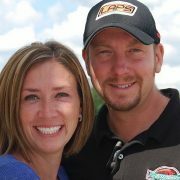 The most track time for your dollar, that is easy on your work, and family schedule. 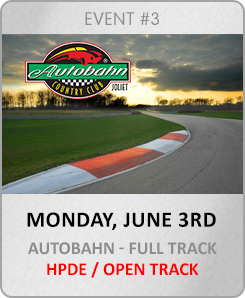 You’ll get 3 hours of track time, and the events will be held on 3 Wednesday afternoons throughout the season. There will be no run groups. The Green Flag will be be dropped and the track will go hot and stay hot for 3 hours until the checkered flag is thrown. The event will be ran under our green groups rules with passing allowed with a point. Drivers will be allowed to enter and exit the track during that time as necessary. You’ll be allowed to manage your time, take breaks, make changes to set up, check tire pressures or whatever is needed. Our ADD events are designed for current Advanced or Intermediate drivers, driving instructors, test & tune for an individual/team for an upcoming event, drivers working on car setup, or for those simply looking to advance their skills quickly with more seat time. 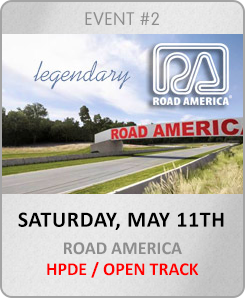 These Events are for experienced drivers only. 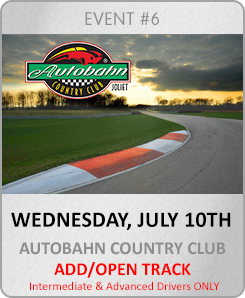 If you are a current intermediate or advanced driver with LAPS TRACK DAYS, AUTOBAHN COUNTRY CLUB MEMBER/DRIVER, PCA, BMWCCA, AUDI CLUB, MIDWEST COUNCIL, SCCA, NASA,….. you may register for these ADD Events. All drivers will need to enter their driving resume/credentials/references when registering. All Drivers will be reviewed and contacted if necessary. Event may start 30 minutes earlier dependent on time of year. If you have any questions or concerns email us or call us direct at 630-205-0055.